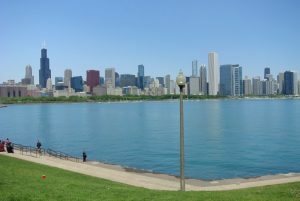 The usual chaotic end to the academic year has limited my local trail running, but a short work-related trip to Chicago gave me the opportunity to explore a city that I have never been to before. Well, I guess I was there once – in my teens my family did our version of the Chevy Chase road trip, and piled into our trusty Wagon Queen Family Truckster and road tripped from coast to coast and back in 3 weeks. We didn’t have the funds to spend the night in Chicago, so we drove through, got out of the car for 5 minutes along Lake Michigan, and continued on to visit a cheese factory in Wisconsin. I am not making this up. And I digress. One of the best ways to see a new city, and get the lay of the land, is to go for a run. 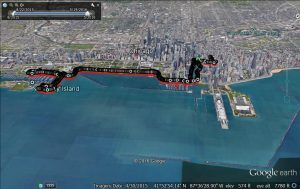 So, on my first morning I stepped out of my high-rise hotel, just a few blocks from Lake Michigan and a little north of the Chicago River, and attempted to sync up my Garmin GPS watch. After a good 10 min of waiting for it to grab the satellite signals, I realized that the towering skyscrapers in this part of the city were having the same effect as walking under a canopy of maple trees – the signal filtering between the tall buildings was apparently too weak for the watch to sync. So, I ran a few blocks east to Michigan Avenue – Chicago’s version of 5th Avenue, and south to the broad bridge over the Chicago River where there was finally enough open sky to sync up my watch. This vantage also offered great views up “The Magnificent Mile“, the heart of downtown Chicago’s shopping, which to me appeared to be a lot of luxury mall stores in really pretty older high-rise buildings. 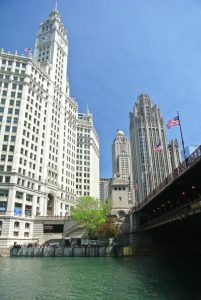 After crossing the bridge, I took the walkway down to the waterfront for a great view up at the famous Wrigley building, the iconic Chicago landmark, and a great view of some of the other classic buildings of Chicago’s skyline. Adjacent to the Wrigley Building, and conveniently out of the above picture was a modern steel and glass monstrosity built by “he who must no be named”, the verbally flatulent presidential candidate known for emblazoning his architecture with the 5-letter serif font “TRUMP Stamp“. After pausing to take this picture, I went a short distance alongside the riverfront, which was quiet now, but would be bustling with late morning tourists upon my return an hour later. In a few minutes however, I was alongside Lake Michigan on a crystalline blue sky morning, and enjoyed the bulk of my run on the the recreational path which runs along the lake for a few miles. 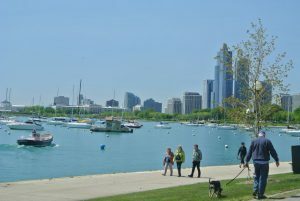 Heading south, I enjoyed the lake on a windless morning, running by a mix of luxury yacht clubs and public parks until I reached the peninsula leading out to the domed planetarium. Turning around here, I caught a view of full skyline, including a nice angle on the Willis (formerly Sears) Tower. I made my turnaround point a small park in front of the home of “Da Bears” Soldier Field, and its partner building, the famous natural history museum “The Field Museum”. And yes, the museum was built before the stadium. From here, I returned to my hotel room, for a 7.5 mile run which was as flat as you might expect a run in Chicago might be, except for the stairs down and up from the river to Michigan Avenue. It was a fun run, but I am looking forward to get back to the trails, and describing them here. The Start/Finish is at the right.